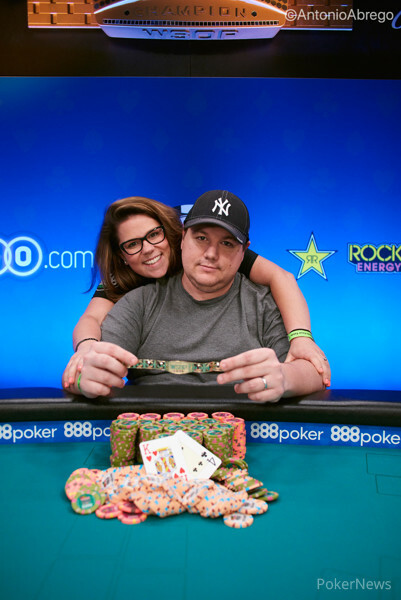 Shaun Deeb has become the first player to win two bracelets during the 2018 World Series of Poker after he defeated Paul Volpe heads-up to win Event #74: Big Blind Antes $10,000 No-Limit Hold'em 6-Handed Championship for $814,179. After taking down Event #42: $25,000 Pot Limit Omaha High Roller back in June for his third bracelet and $1,402,683, Deeb claimed his fourth career bracelet after a lengthy three-handed battle between Deeb, Volpe and Romain Lewis came to an end after the latter exited in third. This left Deeb and Volpe to battle it out for the bracelet, and not for the first time. Deeb ultimately came through the battle, just like he did back in 2015 when he defeated Volpe heads-up to win Event #15: $10,000 Pot-Limit Hold'em Championship. The $10,000 No-Limit Hold'em Championship introduced the big blind ante into the structure for the first time and it brought together a field of 355 players and created a $3,337,000 prize pool. Deeb, who before today's victory was sitting in second place in the WSOP Player Of The Year rankings, spoke after his victory. "It's been ridiculous to win two of these high-level events. It's not going to sink in until I'm home. This is exactly the summer that I came out to do." "The big ace-nine bluff is the one which everyone will talk about. I was convinced he just had two pair and he wasn't going to call me off. It was such a goofy line for me to bluff as well," said Deeb on his decisions at the table. Speaking on the POTY race, he said: "I've always focussed on leaderboards. It's always been a pride of my grinding ability. This was an intense year. I still might have to go to Rozvadov because John Hennigan still has chips in the H.O.R.S.E. tournament. It's like a boxing match. Every time I throw a jab, he counters back, and now he's coming for first place in that horse. He'll always be in striking distance." Deeb is still not done playing this Series, and has plans for Day 1c of Event #75: $1,500 The Closer No-Limit Hold'em (30 minute levels) - $1 Million Guarantee: "I'll hop in The Closer tomorrow and fire and then join Tony's (Tony Miles) rail at the Main Event." The day started with 17 players coming back with a chance of becoming the $10,000 6-Handed champion and claiming the $814,179 first-place prize. Several late eliminations occurred at the end of Day 2, and the play slowed down in the opening level before Anthony Zinno became the first Day 3 player to exit when and took away $32,700. 2018 WSOP series bracelet winner Michael Addamo (16th - $32,700), Jason Mangold (15th-$32,700) Jan-Eric Schwippert (14th-$32,700) and Ankush Mandavia (13th-$32,700) were the next to exit before the final two tables were set. Mark Teltscher (12th - $41,721), Sam Greenwood (11th - $41,721), Matthijs Aerts (10th - $54,831), Mike Watson (9th - $54,831) and Todd Ivens (8th - $74,162) all fell before the unoffical final table of seven. Martin Zamani was the player to burst the official final table bubble after he lost with ace-queen against Bin Duan's ace-king. Zamani lost the majority of his chips prior to this hand when he got into blind-on-blind action. Zamani and Paul Volpe got it all in preflop and the former was in bad shape. Volpe's pocket nines held against Zamani's pocket fours which left the latter with just four big blinds. Zamani did spin it back up to ten big blinds but ultimately fell in 7th place for $74,162. Volpe was involved in the next elimination as well when his ace-king held against John Andress' ace-eight, and Andress walked away in 6th place for $103,152. Scott Margereson came back from 10 big blinds earlier on in the day when his ace-ten beat Michael Addamo's ace-jack all-in at showdown. He then had a series of battles with Shaun Deeb and they doubled through each other several times. But Margereson was unable to perform the ultimate comeback and it was Deeb who sealed his fate when his ace-five held against jack-eight after Margereson had shoved into Deebs' big blind from the small. Margereson, who came fourth in the COLOSSUS for $ 221,772 earlier on in the series, took fifth place this time around for $147,131. Bin Duan was the short stack in the remaining four and he was unable to fight for a place in the final three. His pocket eights were up against Romain Lewis' king-jack all-in preflop and when a jack hit the turn the French rail exploded and the river card brick for Duan to signal his elimination in fourth place for $216,370. The final three were all even in chips and their battle lasted for 58 hands. Volpe and Deeb pulled away from Lewis before the Frenchman pulled it back. But the experience of Volpe and Deeb once again allowed them to move ahead of Lewis before the giants clashed. Deeb five-bet all in with pocket sixes and was called by Volpe who had pocket nines. Volpe's pair held and he took a big lead against Deeb and Romain. Romain was the man to fall in third place for $325,842 and rounded off a great summer for the Frenchman, who also achieved two other runner-up finishes in the series. The heads-up battle saw both players swing in chips and both Volpe and Debb held the lead at some stage. Ultimately is was Deeb who applied the most pressure and when it back down to it he made the correct call. His king-four was ahead of Volpe's king-seven on the three-four-six flop. Volpe was unable to hit his outs, and Debb collected the fourth bracelet of his career as well as the $814,179 first-place prize. With Deeb's mind firmly set on winning the POTY race, it will be an interesting battle over the next few months. Thank you for following all the action with PokerNews and be sure to check back in over the next few days as the 2018 WSOP comes to an end. Hand #168: Shaun Deeb raised to 500,000 on the button and Paul Volpe called. The flop came down , and after Volpe checked, Deeb bet 475,000. Volpe moved all in for 3.49m and Deeb called. Deeb was ahead with a pair of fours, but Volpe had outs. 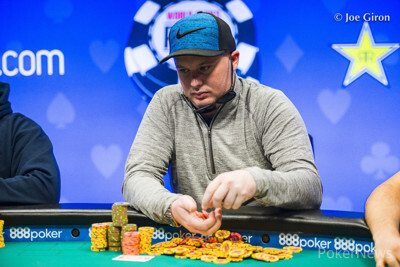 The turn was no good to Volpe, and neither was the river, which meant he was eliminated in second place for $503,196, as Shaun Deeb claimed his fourth bracelet and $814,179. 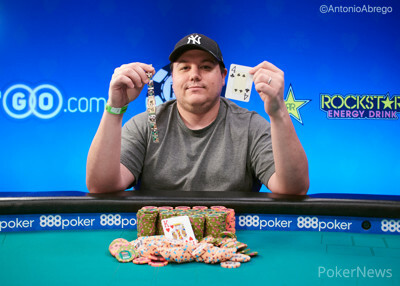 Hand #166: Shaun Deeb folded on the button, and Paul Volpe won the pot. Hand #167: Volpe folded and gave to pot to Deeb. Hand #161: Shaun Deeb got a walk after Paul Volpe folded. Hand #162: Deeb moved all in and Volpe folded. Hand #163: Volpe limped from the button and Shaun Deeb checked. The flop was and Deeb checked to Volpe who put in a bet of 250,000. Deeb proceeded to raise to 675,000 and Volpe folded his hand. Volpe was left with 11 big blinds. Hand #164: Deeb moved all in for effectively 1,850,000 and Volpe called. The board ran out and Volpe doubled up to 22 big blinds. Hand #165: Volpe folded to give Deeb a walk. Hand #156: Paul Volpe called on the button, and Shaun Deeb raised to 750,000, which Volpe called. The flop came , and Deeb checked. Volpe bet 800,000 and Deeb decided to raise to 1.85m. With the action back on Volpe, he thought before he called. The pot was now 5.4m, and the turn was the , and Deeb checked, as did Volpe. The river was the , and Deeb moved all in. Volpe was covered and thought about his decision for a couple of minutes before he folded. Hand #157: Deeb raised to 500,000 and Volpe folded. Hand #158: Volpe called on the button and Deeb raised to 500,000 which won the pot. Hand #159: Deeb raised to 500,000 and Volpe called. The flop came down , and Volpe check-called a 375,000 bet. The turn was the , and both players checked, and the river was the . Volpe checked, Deeb bet 750,000 and Volpe called. "Queen," said Deeb and he took the pot down with two pair. Hand #160: Deeb called on the button, and Volpe moved all in for 2.8m and won the pot. Hand #151: Shaun Deeb raised to 500,000 and Paul Volpe took a good look at his stack and he moved all in. Deeb folded very quickly and Volpe took down the pot. Hand #152: Volpe folded and Deeb took down the pot. Hand #153: Deeb folded and Volpe took down the pot. Hand #154: Volpe raised to 500,000 and Deeb called. The flop was and Deeb check-folded to a 600,000 bet. Hand #155: Deeb raised to 500,000 and Volpe three-bet to 1,430,000 and Deeb folded. Hand #146: Paul Volpe raised to 450,000, and Shaun Deeb called. The flop came , and Deeb check-called for 500,000. The turn came the , and Deeb bet 1.13m and Volpe folded. Hand #147: Deeb raised to 500,000 and Volpe called. The flop came and both players checked. The turn was the , and Volpe check-folded to a 450,000 bet from Deeb. Hand #148: Volpe raised to 500,000 and Deeb called. The flop came and both checked. The turn was the , and Deeb bet 650,000, which got Volpe to fold. Hand #149: Deeb raised to 500,000 and won the pot. Hand #150: Volpe raised to 500,000 and Deeb called. The flop came , and Deeb check-folded to a 375,000 bet. Players are going on a 15-minute break and they will play one more level or until it ends, whichever comes first.